This week on Historically Thinking I’m pleased to once again offer a conversation with Joseph A. Amato. You’ve hopefully listened to him before speaking about local history and family history. 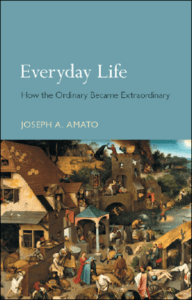 This time we discuss his latest book Everyday Life: How the Ordinary Became Extraordinary. As you can expect from Amato, this is a rich and thoughtful book, as much philosophy as history. What Amato does, as you’ll find out, is examine how the things that we think are just boringly normal and obvious are in fact rich and strange. There is no such thing as a normal human being; or a normal life; or a normal day. In fact, all of the things we take to be normal were once strange. Dr. Amato is a Professor Emeritus of History at Southwest State University in Marshall, Minnesota. A “maverick historian of the first order”, Amato was a principal founder of the Society of Local and Regional History, and has authored numerous books on his region and locality–even though his training is in medieval and early modern Europe. But he also has written histories of suffering, dust, walking, and surfaces, and to this list he will soon add a history of everyday life. He is a historian with probably a deeper philosophical and literary sensibility than most other historians think is quite right–he has even knowingly committed poetry.